Four Thirty Three Inc’s Boxing Star has everything a fan wants. A rags-to-riches story, lots of action and dramatic KOs. From street brawls to the ultimate showdown in the prize ring, each stage packs a punch! You will be fighting tough opponents in a fun story mode and players from around the world in asynchronous league battles. Of all the moves, hooks and uppercuts can be quite effective against an opponent. Watch his health meter when you pull off a right uppercut or a left hook. Make sure you land punches on his face at the right time. Weaving can be a good fighting tactic against an opponent’s attack. In the video above, check out which weave button should you tap when your opponent throws a left hook. When you successfully dodge an attack, you can swipe left to counterattack. Watch the fight carefully and you will know the right way to dodge your opponent. You can also tap the block button (shield icon) to block jabs and hooks. But if you want to counterattack, then there’s no better move than weaving. You might also dodge when your opponent is unleashing a special move. Make sure you are quick in doing that. Just don’t block a special move. It won’t work! You and your foe can activate the special move when the blue hyper gauge below the heart meter is full. Just tap it to unleash, but if your opponent dodges it at the right time, it will be wasted. A lot of practice is needed for dodging attacks if you don’t want your character to be knocked out early in the game. You can replay a previous stage to practice hooks, weaves and counterattacks. 2. How Does the Hyper Gauge Fill Up? A full hyper gauge will let you activate a special move. (You will get a special move once you equip the “mega” glove to your character.) Just tap it to supercharge your boxer and watch him flatten his opponent. But do you know how the hyper gauge fills up? It fills up when you attack and take damage from your opponent. In fact, the gauge fills up faster when your opponent lands punches on your face. Getting hit is the fastest way to fill up the gauge, but would you want to take that risk? What if your special move goes wasted if your opponent dodges it? Let me know your thoughts in the comments section. Noticed your player slowing down while throwing punches? Well, this usually happens when your opponent blocks your attacks. When he blocks, you will lose stamina, so make sure you break his block by throwing an upper cut. The electrocardiogram on the top-left corner of the screen displays your character’s endurance. When the graph shows a dip and the numbers are low, you will need to be careful as during this time, your character’s stamina is low and this is when he slows down. At this moment, a hook or an upper cut would be futile as you will be slower to perform such moves. You may either go for jabs, block opponent’s attacks or dodge them until you recover some stamina. Hooks and uppercuts are slower than jabs, but they deal more damage than the latter. However, jabs are faster and can be very useful for combo attacks when you stun your opponent. You can pull off combos with jabs when your opponent is stunned. Try not to perform consecutive uppercuts or hooks. If your opponent blocks them, you will lose a lot of stamina. 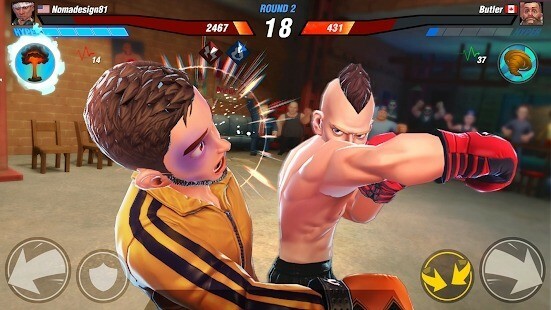 Try to be unpredictable with your attacks by throwing a mix of punches consisting of jabs, uppercuts and hooks. You can weave when the opponent attacks and counterattack. To stun your opponent, you will have to hit him when the stun timer appears below is health bar. Even a jab would do the job. You can then tap left or right to throw jabs and get combo attacks. The stun timer appears when you repeatedly hit your opponent. You will then have to hit him again to activate stun before the timer runs out. Before you begin fighting in Boxing Star, you will be asked to select a “bodytype” and enter your username. You will have to choose one of three character types. Each character’s stats differ from the other. You will find out stats in the video below. It will help you choose the right character for the brawl. I selected Jin as he has the most balanced stats compared to the other two. You can change your body type any time at the “Appearance” menu, if you are not impressed with your current choice. Hit the menu and go to management > appearance > face and body to change your character. You will receive gear from story mode matches and league packages. You can equip them to your character. Tap the gear section under menu and then tap “manage”. Select a glove to equip it by tapping the empty slot below your character. There are various gear types: Some power up your jabs, other increase your uppercut or hook power. They can be very beneficial if you want to reduce your opponent’s health bar quickly. Choose the best gloves before hitting the streets or the boxing ring. You can make them more powerful by upgrading them with a gear of the same type. 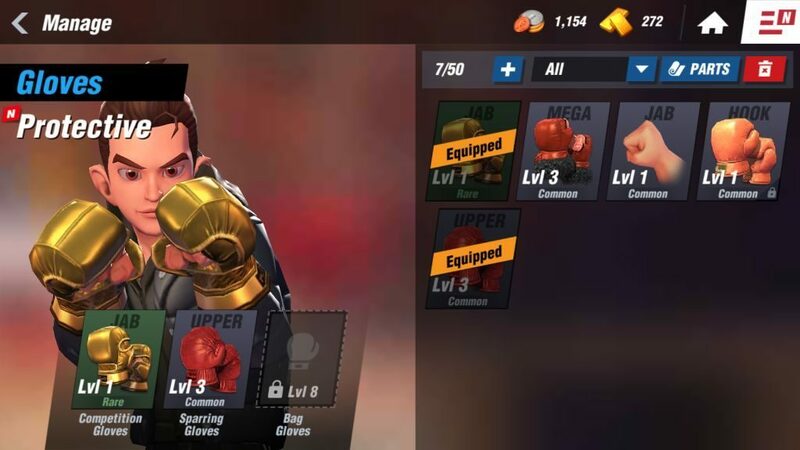 You can also equip protective gear (mouthguard and groin protector) to your character to boost your defenses against your opponent’s jabs, hooks and uppercuts. They also increase your character’s HP. When you fall down, you can revive your opponent by rapidly tapping those red arrows. You will instantly recover if you watch a promo. The video will play after the match ends. If you are not interested in watching promos, then make sure you rapidly tap both the arrows with your thumbs to revive your player before the countdown ends. Use promo when your hero falls for the second or third time, as manual reviving becomes a bit tougher during this time. How do you throw body punches?